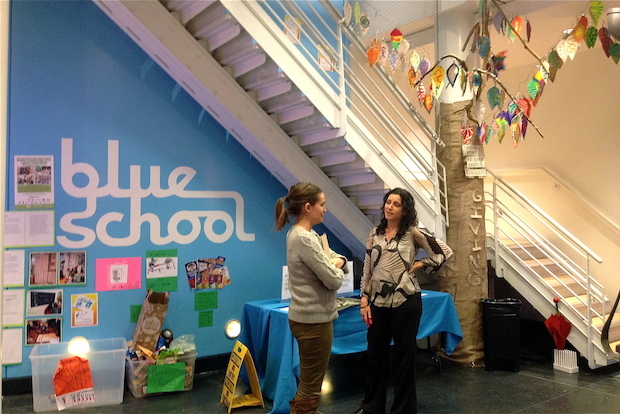 SOUTH STREET SEAPORT — A private school founded by the Blue Man Group is expanding in the Seaport. The Blue School, which has 220 elementary students in its Water Street building, plans to add a middle school starting in the fall of 2015, the school announced this week. Founded by the original cast of the Blue Man Group — an experimental and enduringly popular performance art show — the school currently teaches preschool through fifth grade. The middle school will launch in a newly acquired building at 233 Water St., adjacent to the school's current home at 241 Water St.
“For too long, middle school has been framed as something to ‘endure,'” Allison Gaines Pell, the school’s principal, said in a statement. One middle school grade per year will be added starting in 2015. Applications for the sixth grade are slated to start in the fall of 2014. The Blue School has not yet announced what tuition will be for the middle school, but the elementary school currently charges about $34,000 per year. The new middle school will continue the Blue School’s innovative approach to learning, the school said. The school is known for its small classes with just 13 to 15 students, and an inquiry and project-based approach to learning. Last year, for example, fourth graders did a year-long study of The Odyssey. Teachers work to create structure and set benchmarks for skill sets while they focus on one theme, which is based on students questions and interests. The middle school building will include science and art areas, a rooftop garden and spaces for play. For more information, parents can contact Dawn Williams at dawn@blueschool.org or 212-228-6341 x110. Requirements for middle school applications will be posted to blueschool.org in August.